LITTLETON, Colo. - Nov. 14, 2016 - PRLog -- Attention local churches, schools, counselors, first responders, recovery organizations and front-line service providers. Take a moment to read about this FREE training on how to help people and families affected by addiction! This is an event you will not want to pass up. This event is designed for you and your staff. Will be for Professionals involved in the Addiction Field and for Pastors, Educators and First Responders that witness addiction on the front lines. Event will consist of break-out sessions, panel discussions, networking, and presentations. Make sure to bring as many people on your staff as possible to receive the great training on how to Navigate The World of Addiction and how to properly help those coming to you for help. New Announcement! 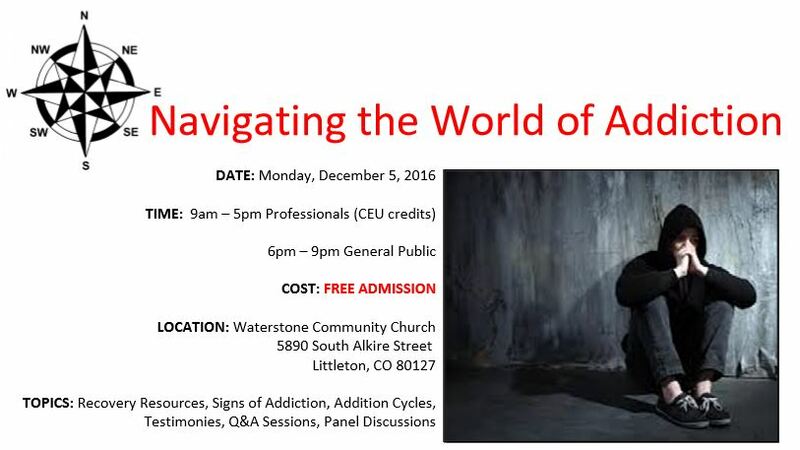 Cali Estes of The Addictions Academy is offering six (6) CEUs for the 9 – 5 portion of the event. Must register for the event. · Keynote Speaker is Vance Johnson, former wide receiver for the Denver Broncos who appeared in three Super Bowls. Following his 10-year career,Vance began to struggle with alcoholism, which ultimately led to a 26-day alcohol-induced coma that almost took his life. Since completing treatment for addiction and domestic abuse, Vance has turned his focus to helping others in the same situation. The Main Trainer will be Cali Estes of The Addictions Academy (Cali Estes, PHD., MCAP, MAC, ICADC www.TheAddictionsAcademy.com). Cali holds a PHD, International Certification as a Drug and Alcohol Counselor, as well as 24 certifications and over 18 years' experience as a Personal Trainer, Yoga Teacher, Pilates Teacher, Food Addictions Specialist and Life Coach. Dr. Estes is a graduate of The Pennsylvania State University and West Chester University. Her unique approach to each person and ability to relate on a humanistic level makes her desirable in the addiction coaching and addiction therapy industry. Rob Lohman of Lifted From The Rut (Rob Lohman, MBA, NCRC-1, NCIP www.LiftedFromTheRut.com) will also be sharing his experience, strength and hope regarding his own journey with addiction and how he is now helping others find freedom from addiction. Definitely an event you won't want to miss! We are expecting a big turnout for the daytime sessions based on a combined network of Pastors, Educators, First Responders and Addiction Professionals….and from the Sponsors getting the word out, especially for the evening session. FREE Addiction Awareness event. Come learn how to move from addiction to recovery!